You are here: Home / Cozy Mystery / Interview With Liz Bean ! 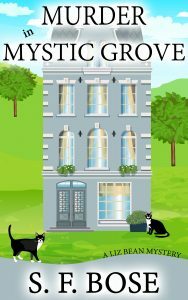 This is an interview with Liz Bean, the main character in my book, Murder in Mystic Grove. Jamie Lee Scott provided the questions and published the entire interview on her website, JamieLeeScott.com. The interview was so much to do and offers some insights into Liz Bean! I hope you enjoy it!